A new report from the Economic Policy Institute examines the unfinished—and widely forgotten—agenda of the March on Washington fifty years ago. But Young said this at the March on Washington for Jobs and Freedom in 1963, exactly fifty years ago on August 28. A new report from the Economic Policy Institute, “The Unfinished March—An Overview,” offers a compelling look at the economic vision that was laid out on that day and has since been forgotten. It also examines the continuing struggle to achieve that vision. Where do we stand today in meeting those goals? Austin describes how concentrated poverty is correlated “with a host of social and economic challenges,” including: higher crime rates, higher exposure to lead, higher prevalence of alcohol and fast food outlets and fewer opportunities to be physically active due to crime and limited green space. All of these factors make the struggle to rise from poverty significantly harder. “[We] must march from the congested ill-equipped schools, which breed dropouts, and which smother motivation, to the well-equipped integrated facilities throughout the cities,” argued Young at the March. But today we have public schools that are essentially separate and unequal. 74 percent of African-Americans still attend majority nonwhite schools, compared to just over 76 percent in the late 1960s. That number had dropped down to 63 percent by the early 1980s, but Austin suggests that progress reversed due to a “lack of commitment by the federal government and multiple decisions by the Supreme Court.” The share of black children in schools that are 90 to 100 percent nonwhite has also stagnated at around 38 percent since the early 2000s. Why are these numbers so significant? With this kind of stark difference in educational opportunities and resources, it’s hardly a surprise that—absent a full employment program that the March speakers called for—we have seen the black unemployment rate remain two to two and a half times higher than the white unemployment rate from 1963 to 2012. “Indeed, black America is nearly always facing an employment situation that would be labeled a particularly severe recession if it characterized the entire labor force,” notes Austin. “If we can have full employment and full production for the negative ends of war then why can’t we have a job for every American in the pursuit of peace?” asked Walter Reuther, president of the United Automobile Workers of America, speaking at the March in 1963. Austin asserts that unless we commit to a full employment policy that brings down the minority unemployment rates, “it will be impossible for blacks to have low poverty rates.” Indeed in 2011, the back poverty rate was 27.6 percent—nearly three times the white poverty rate of 9.8 percent that year, according to the most recent US Census Bureau figures. For African-Americans who do find work, a disproportionate number are paid low wages. In 2006, 36 percent didn’t earn hourly wages sufficient to lift a family of four out of poverty (above approximately $23,000 annually); the same holds true for more than 43 percent of Hispanics, and nearly 25 percent of whites. In 2011, a worker needed to earn $11.06 an hour to lift a family of four out of poverty. 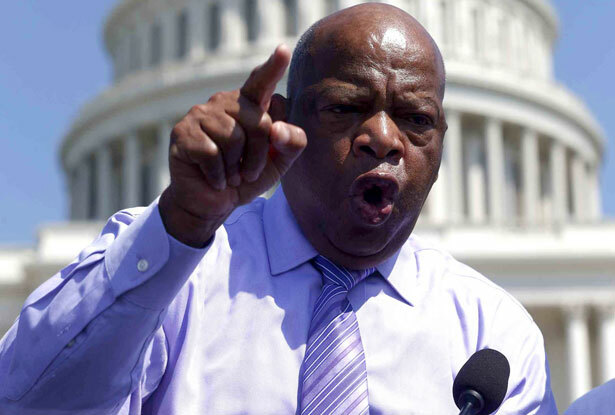 “We march today for jobs and freedom, but we have nothing to be proud of, for hundreds and thousands of our brothers are not here—for they are receiving starvation wages or no wages at all,” said John Lewis in 1963, then the national chairman for the Student Nonviolent Coordinating Committee, and now a US Congressman. The marchers wanted the minimum wage to be lifted from $1.15 to $2 an hour—the equivalent of more than $13 an hour today. But it now stands at $7.25, and its inflation-adjusted value is about $2 less than it was in 1968. (The tipped minimum wage has been stuck at $2.13 an hour since 1991.) If it had kept pace with inflation, the minimum wage would be $10.59 today—$18.72 if it had kept pace with productivity gains. But Congress has raised the minimum wage just three times in the past thirty years. In these times, when so many dismiss institutional discrimination against people of color by simply pointing to President Obama and saying, “End of discussion,” Austin has done a real service with his examination of the data that reveals the unfinished—and widely forgotten—business of the March on Washington for Jobs and Freedom. But what also excites me about the Unfinished March project are EPI’s plans for next steps. I spoke with Christian Dorsey, EPI’s director of external and governmental affairs, who has a strong background in community organizing for children’s literacy, prejudice reduction and affordable housing. Dorsey said that a symposium in August will explore “history, current policy options, and our prospects for actually achieving what needs to be done,” including through nonviolent, direct action. Dorsey said that EPI will offer more resources and opportunities in the fall to inspire and support this kind of action. Stay tuned and get involved—help finish the March. Frontline looks at the Coalition of Immokalee Workers’s Fair Food Program and its transformational impact on the lives of women in the fields. Watch A Voice for Workers on PBS. See more from Frontline. “South remains the epicenter of US child poverty crisis,” Institute for Southern Studies. “Data Book: State Trends in Child Well-Being,” the Annie E. Casey Foundation. This report provides information and highlights data trends concerning the conditions of America’s children and families, by ranking states and using indicators such as economic well-being, education, health and family. The foundation found that the child poverty rate stood at 23 percent (16.4 million children) in 2011. However, both the teen birth rate and the rate of high school students not graduating in four years, as well as the child and teen death rate, have all declined. The report also focuses on early childhood, showing that the lingering effects of the recession and continued high unemployment have disproportionately affected the country’s youngest children—for instance, 54 percent of the nation’s 3- and 4-year-olds are not enrolled in preschool. “The Adolescent Diversion Program,” Center for Court Innovation. New York is one of only two states in the country that treats 16- and 17-year-old defendants like criminally responsible adults—nearly 50,000 of these teenagers are annually prosecuted in the state’s adult criminal justice system. This report evaluates the Adolescent Diversion Program that aims to foster a more developmentally appropriate approach to the age group, by enabling some to avoid formal prosecution, and linking them to services. The program also established special courts and encouraged rehabilitative approaches. Participants in the program were less likely than comparison cases to be re-arrested on felony charges. Consistent with other research, high-risk young people fared better in the program than low-risk youth. “2013 Report on Child Care in Cook County,” Illinois Action for Children. This report examines childcare trends, and in particular, the high cost and difficulty finding care, in the Chicago area. Approximately 900,000 children under the age of 13 live in Cook County, and a large proportion (if not a majority) receive care from someone other than their parents or guardians. The report shows how geographic differences can affect parents’ success in finding care, and also found that most types of care in the region has risen faster than inflation, as family incomes decline. “A Theory of Poverty Destabilization: Why Low-income Families Become Homeless in New York City,” Institute for Children, Poverty and Homelessness. The rate of families with children entering homeless shelters in New York City rose 17 percent from 2008 to 2011. The first report in this series uses data on the demographics of the city and focuses on neighborhoods to examine the destabilizing factors affecting at-risk families, in an effort to better understand the relationship between stable poverty and rising homelessness. “State of the Nation’s Housing 2013,” Joint Center for Housing Studies at Harvard. Though a national housing recovery is underway, millions of homeowners are still struggling to pay their mortgages or are in debt, and housing cost burdens are reaching record levels. The national home ownership rate fell in 2012 (for the eighth straight year), and to compound such challenges, sequestration will reduce the number of households receiving rental housing assistance. This report further addresses the need for more affordable housing nationwide. The number of Americans spending half or more of their incomes on housing is at an all-time high, with 20.6 million households shouldering such a burden. “2013–2014 American Human Development Index,” Measure of America. This report uses alternative data points to “tell the story of how people—not just the economy—are doing.” It analyzes well-being in three areas—health, education and earnings—to understand how Americans invest in their families and live to their full potential. It ranks the states, large metropolitan areas and racial/ethnic groups within those areas. Among their most interesting findings were changes over time—for instance, Michigan saw the greatest decline in human development over the past decade, and African-Americans saw the greatest increase in life expectancy (as compared to other racial/ethnic groups). Ratio of black unemployment to white unemployment, 1963-2012: 2 to 2.5 times higher, nearly every year. Families receiving cash assistance, 1996 (pre-welfare reform): sixty-eight for every 100 families living in poverty. Percentage of US population that is African-American: 13 percent. Percentage of homeless shelter population that is African-American: nearly 40 percent. Samantha Lachman wrote the “Studies/Briefs” and co-wrote the “Clips and other resources” sections in this blog. While the goals set out at the March on Washington have yet to be completed, major victories for the LGBT movement this week now have experts pondering what the movement’s next steps should be.